KLYK came to life on 17 July 1957 after the partnership of D. Gene Williams and Delbert Bertholf (Del Cody) received authority to change the call letters of KSPO to KLYK, and to change the frequency from 1340 kHz to 1230 kHz. KSPO on 1340 kHz signed off the air at 12:25 PM and five minutes later at 12:30 PM KLYK signed on the air on 1230 kHz. The station's location, the Realty Building, did not change. To mark the change, Cody said the changeover will mark the start of an effort by announcer Don Evans to achieve a new marathon broadcast record of 161 hours. It is not known how long he lasted. The author has not found any documentation about the format of the station during this time. In June 1958, Bertholf and Williams sold KLYK to Harold Lampel and Associates for $120,000 with Bertholf and Williams retaining creditor interest in the station. "NOW! K-LYK BANS ALL ROCK 'n ROLL FOREVER!" That was the headline of an article in the Spokesman-Review from 27 July 1958 introducing a new radio station KLYK or Kay-Like. The article goes on to say that "For the first time, Only 'music in good taste' to be programmed. The station's new owner, Mr. Harold Lampel said, "We're completely eliminating all rock 'n roll, rattledy-bang, overly loud, raucous, 'poor taste' music." The station's programming was "aimed toward people who prefer a higher type music for good listening and in good taste." The music was to consist of songs from various musicals and songs by Lawrence Welk, Glen Miller, Mantovani, etc. Most of the songs would be instrumental pieces, with only one out of six being vocals. William B. Murphy was named general manager in September 1958. At the time, Murphy owned station KPVA in Portland, Oregon and entered the radio field as an announcer and writer at KIT in Yakima, Washington in 1940. During World War 2, served in the Navy in the South Pacific, and after the war, he worked at radio stations in Honolulu and in San Francisco. The KLYK's FCC records are difficult to elucidate, but as best as can be determined it appears that Williams and Bertholf repossessed the station from Lampel, and then transferred control of the station to the partnership of Marie Storm Taft, Archie G. Taft Jr., and W. D. Simpson on 8 April 1959, with Williams and Bertholf maintaining interest in the station as creditors. Station license application records of the time stated that William L. Simpson was the manager, Eric Rhode was the program director, and Dan Markham was the sales maanger. There was an engineer, four announcers, a traffic girl, a bookkeeper, a newsman, and three salesmen on staff. The station started to use the slogan "Click." The station owners scheduled programs which reflected this slogan. They included, "KLYK Clock," "KLYK Coffee Club," "KLYK's Nifty Fifty," and "Music that KLYK's." The precise format of the station when the Tafts controlled it is not clear. According at least one newspaper account, the station was an outlet for the American Broadcasting Network and the Mutual Broadcasting System, and it carried "Don McNeil's Breakfast Club," Frank Hemingway, and Edward C. Morgan. The station went silent in April 1962. 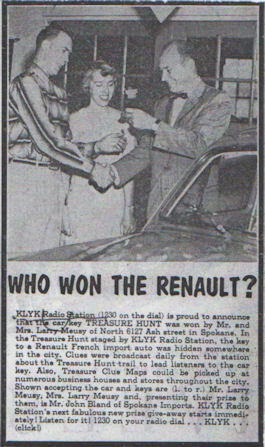 Car Giveaway Contest, 21 June 1959. Click on the photo for a larger view. In May 1962, Bertholf noted that he wanted to "divest [himself] of a contract on a radio station that is non-operative and badly in debt" and asked for more time from the FCC to find someone to whom he could sell the station. However, he was unable to find a suitable buyer right away, so a deal with KUDY was put on the back burner. Meanwhile, Bertholf and Williams repossessed the station from the Tafts and Simpson. To further complicate matters for the station owners, the Spokane City Government had purchased the Realty building, the home of KLYK's offices, studios, and transmitter plant with the intention of turning the building into a City Hall annex. Spokane City Manager Henry B. Nabers noted in April 1963 that the station's offices and studios would have to move, but recommended that the city rent out a small portion of the building to the radio station for its transmitter plant for $100 per month. In April 1964, Bertholf transferred his interest in the station to Williams, making Williams the sole owner. The station stayed off-the-air until 22 September 1964, when Williams changed the call letters back to KSPO and signed on with a fairly successful country and western format. At that point, KLYK ceased to exist. One day as a gimmick, the station played the song "Itsy Bitsy Teenie Weenie Yellow Polka Dot Bikini" non-stop until someone showed up at the station's doorstep wearing an one. It is not known if someone actually showed up in a bikini, but one can probably assume that the DJs (as well as the listeners) were sick of the song. Misty Lane, the contributor who visited KLYK numerous times and who passed on this anecdote, notes that the station was partly automated and partly live. The following is an account of KLYK by Jerry Anderson; read it and enjoy. "I was an avid radio listener growing up and I remember listening to KSPO the day they switched frequencies and call letters. To my recollection they were doing a remote broadcast from the window of Pratt Furniture Store on North Post, downtown Spokane at the same time. I remember their station jingle of a female vocalist singing "K-L-Y-K...click, click, Spokane." "In the fall of '61--my freshman year at Eastern-- my broadcasting teacher told me to apply for a part time opening at KLYK. The studio was then in the Realty Building. They were fully automated with the racks of reel-to-reel tape decks typical of the first automation systems of those days. I can't remember the program director's name. He was the only person there at the time when I came in to see him about the job. He handed me some news from the AP teletype and a commercial, showed me the production studio, and told me to read the items and record them using the reel-to-reel that was cued up with a blank tape. He listened to it, gave me a scathing critique and sent me on my way. 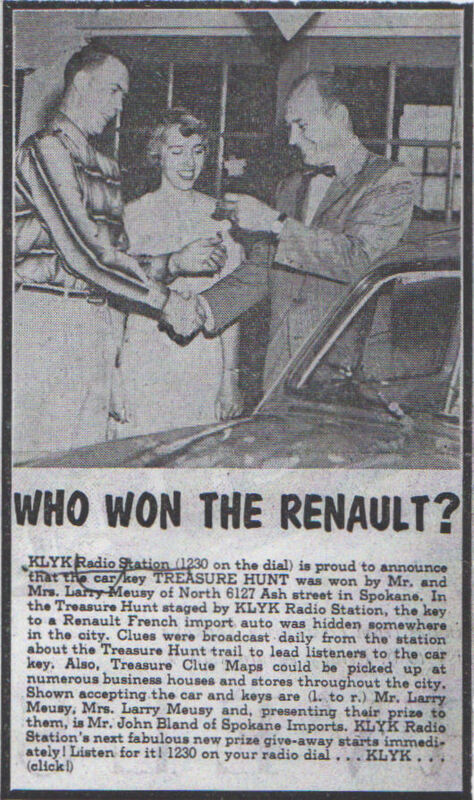 "My consolation was that the following summer I applied for and was hired for a part-time position at KXLY (my first radio job) which was rated the number two station in the market. By that time KLYK was off the air." "Another KLYK memory: The automation was set up with a music reel and another reel was the announcer reel with the titles and artists. Listening to it one day the reels got out of sync and the announcer reel was three titles later than the song that played throughout the hour." Anderson, Jerry. Email correspondence to Bill Harms. 26 May 2008. Application Record - Broadcasting. Federal Communications Commission. Washington DC. Entry for Construction Permit to change frequency from 1340 to 1230. Granted on 6 June 1957. BP-10940. Via Xen Scott. Application Record - Broadcasting. Federal Communications Commission. Washington DC. Entry for License to Cover Construction Permit BP-10940. Granted 29 August 1957. BL-6705. Via Xen Scott. Application Record - Broadcasting. Federal Communications Commission. Washington DC. Entry for Voluntary Assignment of License granted 26 June 1958. BAL-3052. Via Xen Scott. Application Record - Broadcasting. Federal Communications Commission. Washington DC. Entry for Voluntary Transfer of Control of Licensee Corporation. Granted 8 April 1959. BTC-3048. Via Xen Scott. Bertholf, Delbert. Letter to Federal Communications Commission. Request to dispose of KUDY construction permit. 7 February 1964. National Archives, College Park, MD. Bertholf, Delbert. Letter to the Secretary of the Federal Communications Commission, Washington, DC. 21 June 1962. National Archives, College Park, MD. Bertholf, Delbert. Letter to Sam Miller, Washington, DC. 12 May 1962. National Archives, College Park, MD. "City Station Leaves Air." Spokesman-Review. Spokane, Washington. 12 April 1962. Page 7. "FCC Authorizes Shift of Control." Spokane Chronicle. Spokane, Washington. 10 April 1959. Page 7. Garliardi, Joseph P. for Kizer, Gaiser, Stoeve, Layman, and Powell on behalf of KLYK. Inc. Spokane, Washington. 18 January 1962. Reference made to station going silent in April 1962. "KLYK Deal Completed." Spokesman-Review. Spokane, Washington. 27 June 1958. Page 5. "KLYK Deal O.K. Sought." Spokesman-Review. Spokane, Washington. 5 February 1959. Page 6. "KLYK May Broadcast Again Soon." Spokesman-Review. Spokane, Washington. 22 April 1964. Page 11. "KLYK Off Air; Move Pondered." Spokane Chronicle. Spokane, Washington. 11 April 1962. Page 3. KLYK Proposed Program Schedule. Included in the Application for Renewal of Broadcast Stattion. 28 October 1959. National Archives, College Park, MD. "KLYK Sale O.K. Asked by Owners." Spokane Chronicle. Spokane, Washington. 2 June 1958. Page 3. "KLYK to Be Sold." Spokesman-Review. Spokane, Washington. 10 April 1959. Page 8. "KSPO Frequency, Call Will Change." Spokane Chronicle. Spokane, Washington. 13 July 1957. Page 3. "KSPO to Shift on Radio Dial." Spokesman-Review. Spokane, Washington. 7 June 1957. Page 7. Lane, Misty. Email Correspondence to Bill Harms. 28 July 2007 and 19 and 23 May 2008. "Now! K-LYK Bans All Rock 'n Roll Forever!" Spokesman-Review. Spokane, Washington. 27 July 1958. Page 2. "Radio Post to Murphy." Spokesman-Review. Spokane, Washington. 7 September 1958. Page 19. "Radio Station Rents Tower." Spokesman-Review. Spokane, Washington. 26 February 1963. Page 5. "Radio Station Sale Approved." Spokane Chronicle. Spokane, Washington. 22 April 1964. Page 29. "Radio Stations Named in Suits." Spokane Chronicle. Spokane, Washington. 20 March 1962. Page 3. Read, Tom. Email Correspondence to Bill Harms. 23 May 2008. Simpson, William L. Letter to the Federal Communications Commission. Part of a formal application for a request for an extension to remain silent. National Archives, College Park, MD. "Station Plans Letter Change." Spokesman-Review. Spokane, Washington. 13 July 1957. Page 6. Taft, Archie, Jr. Spokane, Washington. Letter to Federal Communications Commission. 27 September 1962. National Archives, College Park, MD. Williams, D. Gene. Statement for the record regarding his status with KLYK and reaquisition of the station. 6 June 1963. National Archives, College Park, MD.